I really love entertainment and events that the whole city celebrates. I always find myself at the free outdoor movie on Friday nights, frequenting all the festivals, feeding on the vendor food. I try to go watch the free bands that play at Waterfront Wednesdays and at pavilions in the park. There is just really something special about seeing fireworks lit from a bridge, billowing out over the river, boats and bystanders basking in the beautiful beams. 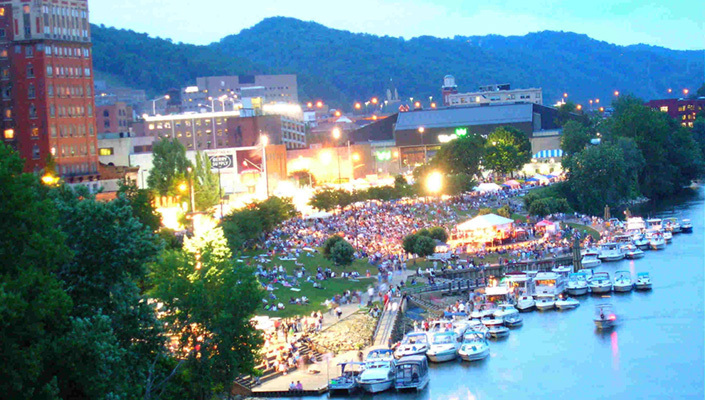 This month, the city of Wheeling, West Virginia will be celebrating – itself. This year West Virginia will be blowing out 150 birthday candles. One of two states that formed during the Civil War, W.V. is the only state to form by seceding from a confederate state – Virginia. With an abolitionist stance on slavery, W.V. became the 35th state in the Union 150 years ago and was also pivotal in providing us with the word “redneck.” Despite the terminology it’s taken on today, it actually refers to a multi-racial union of miners who were tired of the economic exploitation from the coal companies, and wore red bandanas around their necks to distinguish themselves from the non-union workers. Wheeling was the birthplace where West Virginia began and the state’s first capital. A month-long tribute, West Virginia’s birthday will be book-ended by a lot of things in Wheeling. Historical lectures about Lincoln and leading up to statehood will commence in correspondence with tour-taking, readings and re-enactments, a block party, and a ball. Along with all the other entertainment, Wesbanco Arena will feature a free Party on the Patio with The Rusty Haywhackers on Friday June 7th. The Haywhackers have their hands full that weekend, as they will also be joining the line-up at June Fest. Whether you come out to lay on the lawn and watch Pitch Perfect on an outdoor screen overlooking the river or to hear some music at Toe Tappin’ Tuesdays, Too, don’t miss out on all the free events this city serves. Take a hike through the hills, a raft on the river, a kayak or a canoe. Sing some songs and make some s’mores at the Environmental Education Center. Whatever you do, celebrate this city like this city celebrates the summer. Blow out the birthday candles with Wheeling, because living in this city in the summer really is a piece of cake!